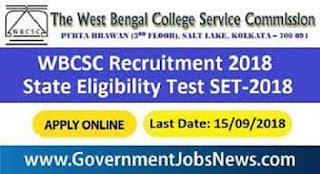 West Bengal College Service Commission WBCSC notification invited application for State Eligibility Test SET 2018. 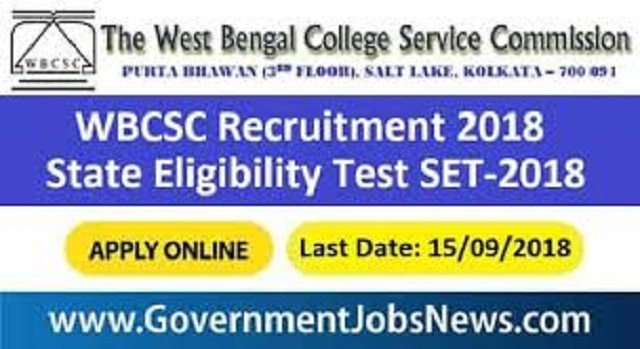 WBCSC Recruitment 2018 for SET Examination is for the post of Assistant Professor vacancies in Universities & Colleges of West Bengal. Those Candidates who are interested in the State Eligibility Test 2018. Please Read all the details and information and apply online before the last date. Last Date for Submission of Applications: 15/09/2018 till 6:00 PM. Candidates who have secured at least 55% marks (without rounding off) in Master’s Degree OR equivalent examination from Universities/Institutions recognized by UGC are eligible for this Test. The eligible applicant shall be issued call letter to appear for the following test. As such, there is no upper age limit for applying for SET. However, for the purpose of recruitment, the relevant Government Order will be applicable. The candidates who have passed the UGC/CSIR JRF examination prior to 1989 are also exempted from appearing in NET/SET. The candidates who have cleared the State Eligibility Test (SET) accredited by UGC for eligibility for Assistant Professor held prior to 1st June 2002 are eligible to apply for Assistant Professor anywhere in India. For SET held from 1st June 2002 onwards, the qualified candidates are eligible to apply for the post of Assistant Professor only in the Universities/ Colleges situated in the state from where they have cleared their SET.